Friday means yet another recipe and I’m sorry I’m not sorry if you are getting tired of my fall food posts but it tissss fall so there! 😛 I’m still intrigued by pumpkin and the various things I can make up with it that ‘fit’ my standards of snackage. 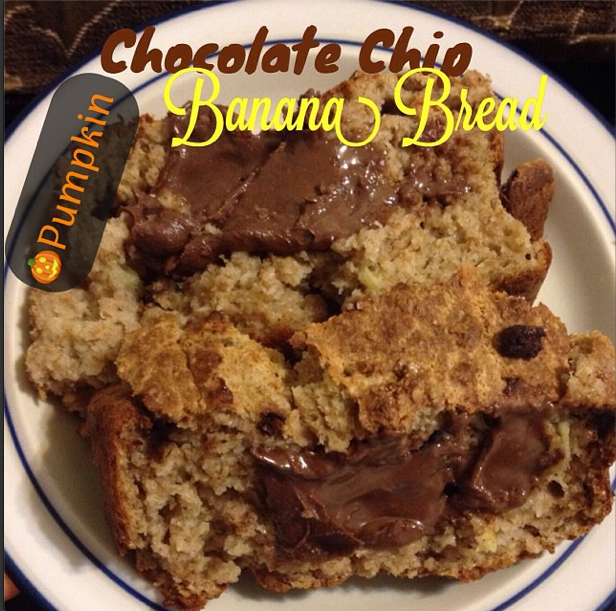 I recently came across a few posts of individuals who infused their pumpkin goodies with banana and, well, if banana is in the picture, it’s a winner in my book! So who were some of the standouts that inspired this latest recipe? 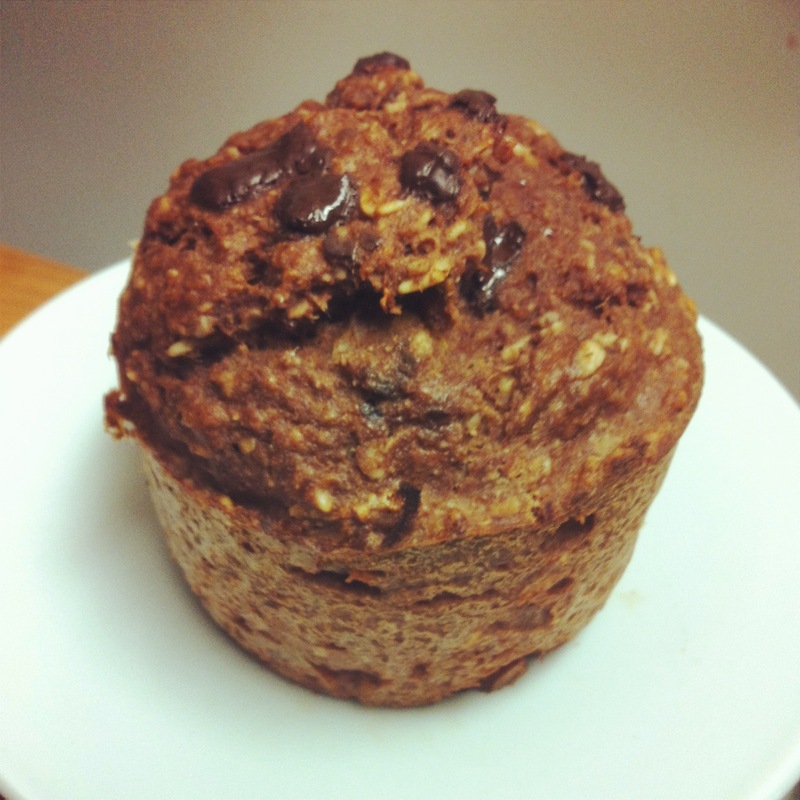 These lil Healthy Banana Pumpkin Muffins from Jennifer over at Peanut Butter and Peppers. The ingredients were A-okay in my book, nutritionally speaking, they had banana in them AND I liked the combination of flours and meals for the dry ingredients. Lil bit of flour, lil bit of flax meal, lil bit of oat bran. Lil bit of this, lil bit of that. I like making combos myself so I liked this list. Of course, my ‘flour’ choices were all different (exception of the flax) but still, the combining idea is there. And hey, look at them, super moist and cute! The second recipe that I oogled was by FitKitten on Instagram. Lindsey has some AMAZINGLY droolworthy IG posts and all of her recipes can be found on her blog, The Fit Kitten, or her IG account. Make sure to check her out! Foodporn no? This was the recipe that really got me inspired and I followed the most. Obviously, like the other recipe, the first thing that caught my eye was the banana-pumpkin combo. I tweaked the flour choices and their ratios to be more of a blend like the first recipe, which led to my version having slightly more ingredients, but hey, it’s tasty so that’s what matters right? I also made two versions…. Half a dozen mini cacao nibs speckled muffins for myself. So… ready for the recipe? *I don’t have pumpkin pie spice so I used the 4 spices as mentioned. If you have pumpkin pie spice, feel free to use a tbsp of that instead of the 4 separate spices. Preheat your oven to 325 degrees. Throw all your dry ingredients in a bowl. 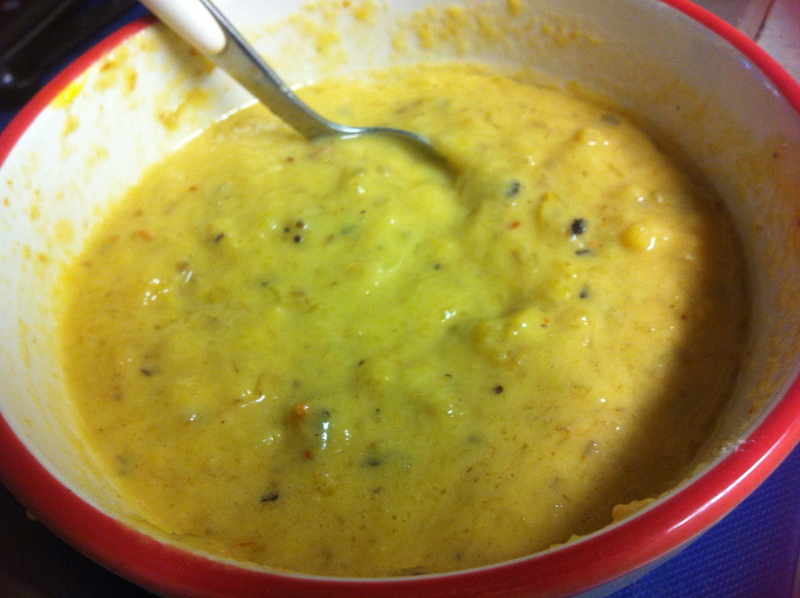 Melt the banana in a bowl and combine all of your wet ingredients together. Work quickly or your coconut oil will harden and become clumpy. If that happens, heat the mixture in 30 second intervals so re-melt it and not cook the egg whites. Fold your wet into your dry and portion out into your sprayed muffin or loaf tins. Bake in the oven until the tops are brown and a toothpick inserted into the centre comes out clean. Let cool before attempting to flip them out of the tins and enjoy! I did not add sweetener but if you really like your goodies sweet, feel free to add some Stevia or another sweetener of choice. If liquids are used you may have to add a bit more oats depending on the volume added. Both me and my boyfriend enjoyed these very much. They are not overly sweet, but rather, have a nice mildly spiced flavour. The carob chips melt into the bread if you choose to use those (or regular chocolate chips) versus the cacao nibs provide a nice crunch. Why did I choose to alter the use of the flours used in Lindsey’s original recipe? Because I can never leave a recipe unaltered it seems. Ever. I don’t know why, I just cannot leave it alone. I don’t use wheat flours in my baking. Instead, I prefer to add in other types of “flours” to amp up the nutrients and play around with the macro ratios. 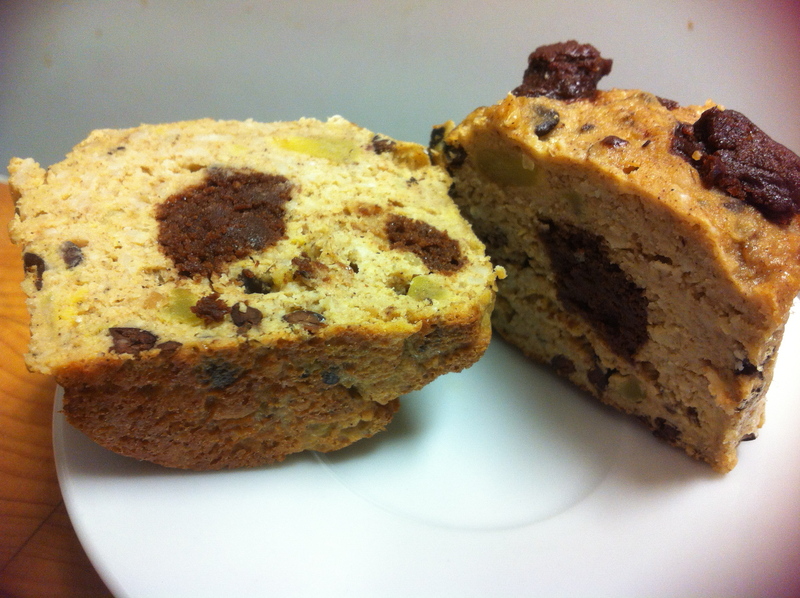 Let me explain the variety I chose for this recipe (and many of my previous baked goods). Coconut flour… Great source of fiber, gluten free, and it contains more protein and less carbohydrates than most other flours. I find that using it in the right amounts can result in baked goods that have a denser, cake-like feel, which I tend to like. This is probably due to the fact that this flour soaks up a ton of liquids so make sure to add ‘moisturizers’ (eggs, egg whites, fruit/veg purees, etc) and liquids to your recipes when trying to use this flour to prevent dried baked goods. 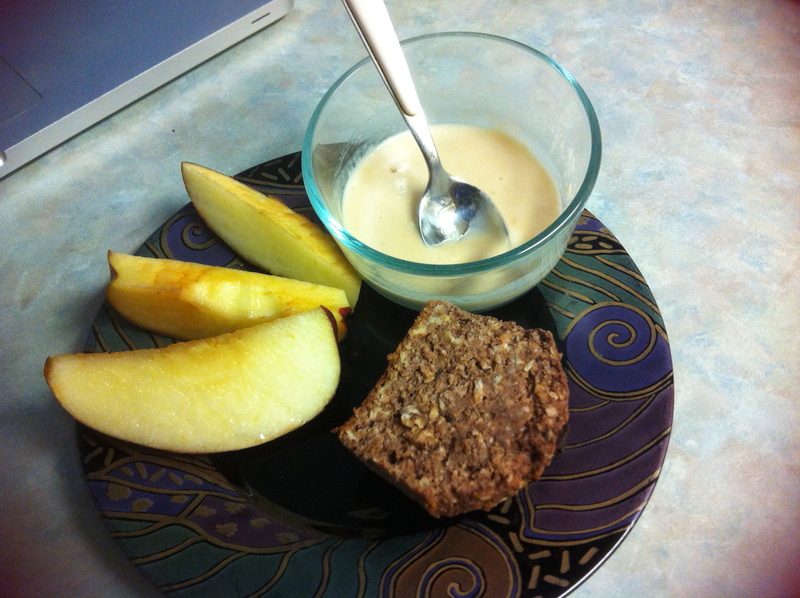 Flax meal… Great source of fiber, healthy omega-3 fatty acids (particularly ALA), and manganese (antioxidant properties). Flax meal is great for the digestive system as well as it forms a gel-like substance that help to keep things movin along through the tract. 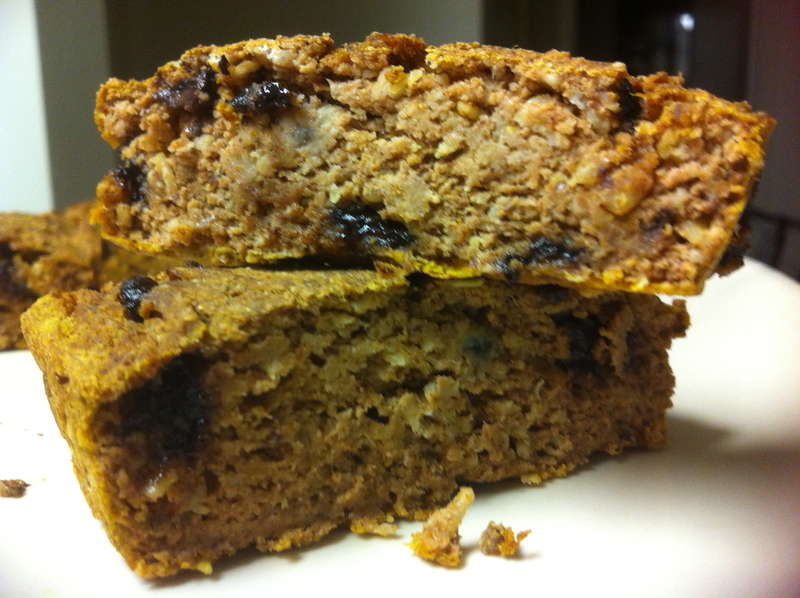 I find that the oils found flax not only keeps baked goods more moist but they also add a nutritional boost! Also, like coconut flour, but not to such a high degree, flax meal tends to thicken batters resulting in fluffier baked goods as well as things like pancakes and mugcakes. 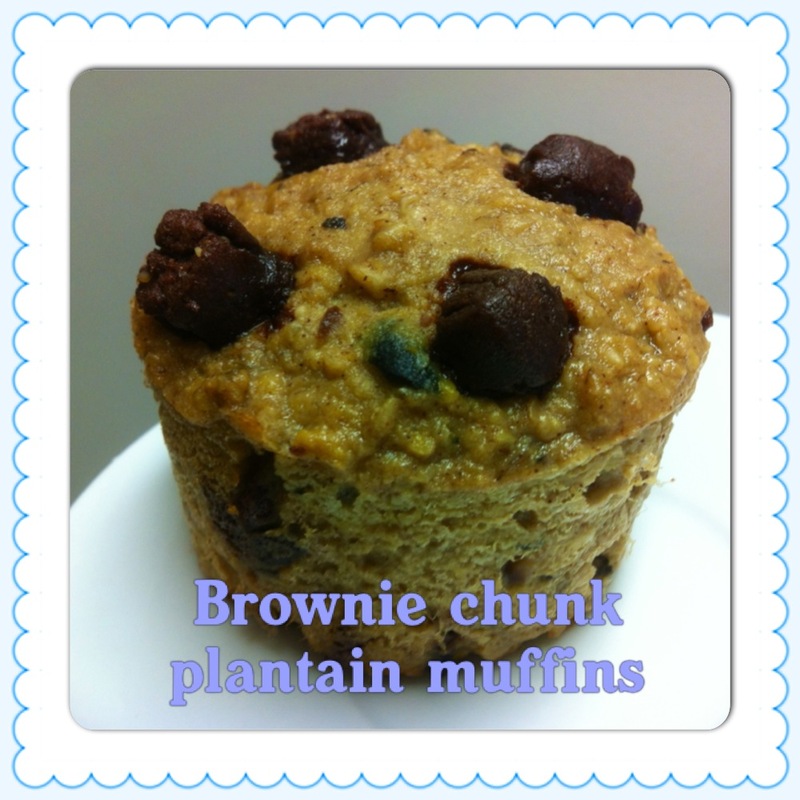 Oats or oat flour…High in fiber, selenium (antioxidant properties) and manganese. So many good things come from these lil guys including, but not limited to, lowering cholesterol, blood pressure and cardiovascular risks, antioxidant properties, stabilizing blood sugar levels, keeping you full and satisfied longer and just being so darn yummy! I have found that some people complain that oat flour in recipes make for denser and heavier goods. For this reason, I tend to combine flours to add some moisture (ie. fattier flours/meals) in to add some variety and counteract some of the heaviness. Personally, I don’t find this flour too heavy, but that could be because I have adjusted to it rather than pastry flours that rise better when baked. Whey… This is completely optional in baked goods but it adds protein, great flavour, calcium and bulk to batters with very little extra carbohydrates. That being said, it’s hard to ensure that goodies don’t get dried out when using whey. Due to this, like coconut flour, ensure that you take care to add some moisturizers to prevent eating a tire. Vegan protein powders are also great choices and tend to have a more flour-y consistency. Please don’t take my points here as the stone cold truth. I have spent lots of time experimenting and I’m still working with these flours to see what works and what doesn’t. Gluten free and alternative flours are not always the easiest to work with and require a lil bit more work than traditional wheat flours do. What I have mentioned here is simply what I have seen from my own baking adventures. but sometimes you end up with a nice treat. I also want to say a big thank-you to Kiersten for hosting Recipe Friday every week so that all of us baking and cooking experimenteurs can showcase some of those creations that came out of the good side of the oven. Any tips for working with alternative flours? Any Paleo followers out there? Categories: Blog Love, Recipe, Recipe Friday, Tips and Tricks | Tags: Alternative Flours, Baking, Banana, Blog Love, Candyfit, Coconut Flour, FitKitten, Flax Meal, Healthy Baking, Inspirational Baking, Muffin, Protein Muffins, Protein Powder, Pumpkin, Recipe, Recipe Friday, Tips | Permalink. Thanks to Miss CandyFit herself for hosting this weekly gathering and go and check out her page here for many drool worthy recipe ideas. 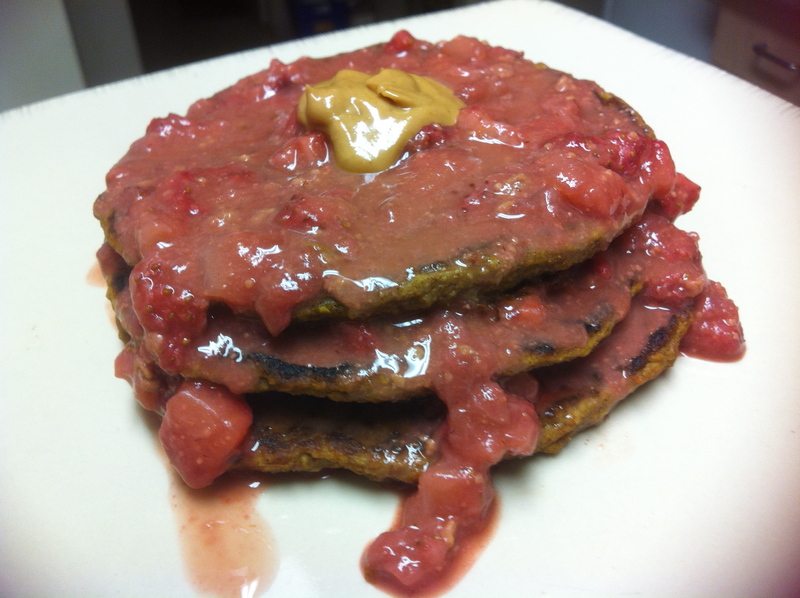 I’m already eying those beautiful ginger pear pancakes posted by Davida over at The Healthy Maven. The good thing about these cakes is that there are soo many squash varieties out right now to choose from and experiment with. I went with turban squash because I had a lil bit left over in my fridge. You could easily use buttercup or carnival for the same carbohydrate and sugar amounts OR if you want a little bit less sugar (but greater carbs overall) you could choose butternut or acorn OR for the ultimate sweetness, go with 85 grams of kabocha for 11 grams of carbs and 5 grams of sugar. ONE last note, don’t peel your squash. PLEASE don’t. You are peeling away vital nutrients that are located at the skin layer. For the skin phobes, don’t worry though, even if you normally peel them (which I would totally recommend actually trying the skin as it’s delicious all crisped up when you roast your squash! ), this recipe uses a blender so there will be no skin particles in your pancakes I promise. 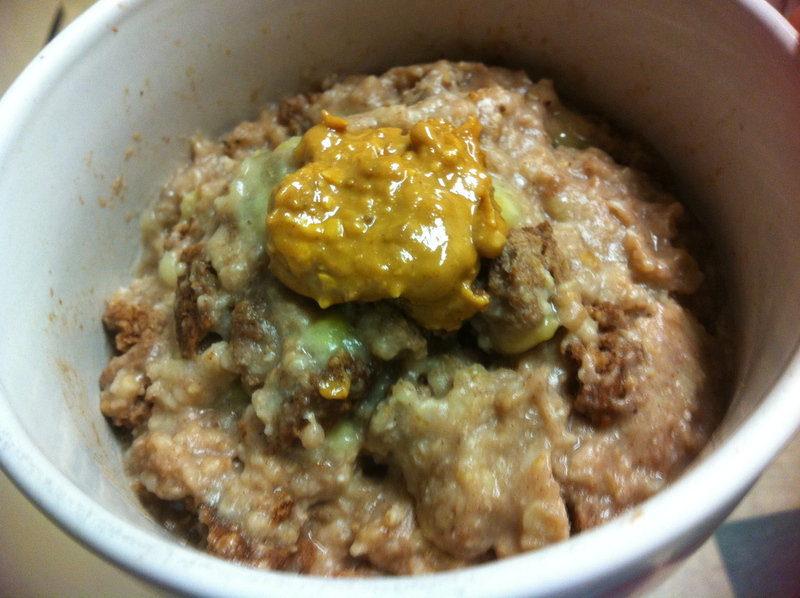 In a blender, blend your 1/3 cup oats (reserve that tbsp), almond milk, egg whites and squash. Dump that in a bowl and add in the rest of the ingredients (exception being the oil). You will get a thick mixture but that is good for fluffy pancakes! Preheat a pan with some of your coconut oil on medium to medium-low heat. Cook your pancakes as normal. When you have all your pancakes done you can stack and add your topping! Favourite nut butter other than peanut butter or almond butter? That cashew one is new to me but it’s sooooo good! Weirdest ingredient you have used in pancakes/waffles? 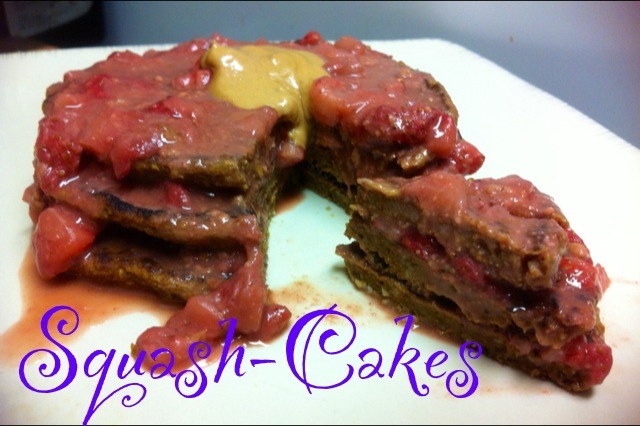 Categories: Blog Love, Recipe, Recipe Friday | Tags: Breakfast, Candyfit, Healthy Breakfast Ideas, Healthy Recipe, Link Up Party, Meal Inspiration, Pancake, Protein Pancakes, Recipe, Recipe Friday, Squash | Permalink. They look so funny with that random bump on their bottoms…like a growth of some kind. This is a carnival squash. Tiny and beautifully coloured, this lil guy caught my eye at the Hamilton Farmers market and then was failed to be used until this week when I decided that it was time to make something a lil more creative as it was a ‘dinner on a plate’ night (aka no work that night). 😀 So what did I make? Oh it was good 😉 Toot Toot! So now comin at ya is the recipe for this lovely fall-inspired dish. Chop your garlic and onions and add those to the pan when it is warmed up. Saute the onions and garlic until fragrant and caramelized. Dice up your tomatoes and mushrooms. When your onions and garlic are done, add tomatoes and mushrooms to the pan and saute until they are starting to stick to the pan. Break up your burger into the pan. Add a few tbsp of water to the pan, add your spices and pop a lid on the pan to allow for the tomatoes to burst. When the water is all gone, stir, remove from the heat and set aside with the lid to keep warm. When your squash is cooked (will be soft when pierced with fork) and slightly cooled, carve out a bit of the squash middle ensuring that you are not poking a hole into the sides of the squash. Stir that squash mash into your beef stuffing mixture. 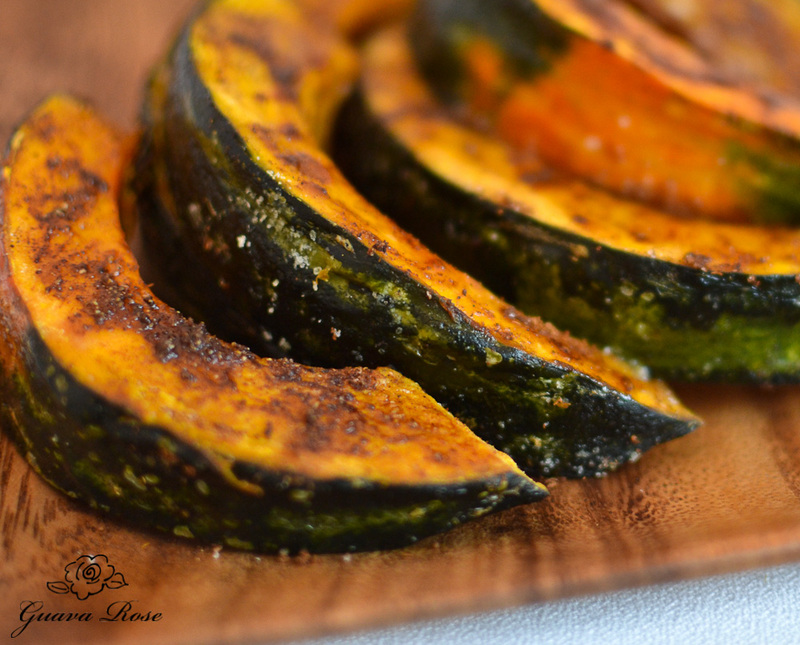 Fill your squash with your beef filling and place the entire stuffed squash into the oven on broil for a few minutes. If you are adding cheese, add it on top before you broil to allow for the cheese to melt. When the top is browned to your liking, remove from the oven and enjoy it with whatever side you fancy. 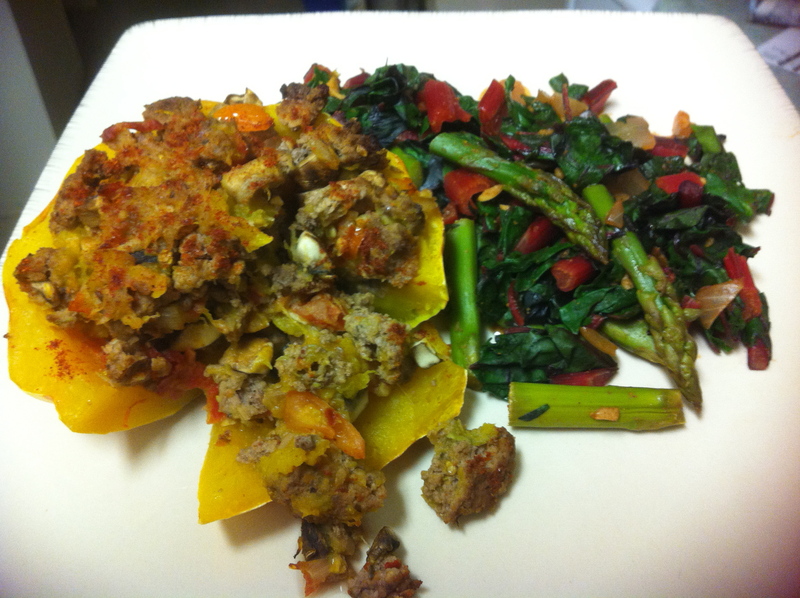 I enjoyed mine with a Swiss chard and asparagus saute (recipe below). Because I was in a rush, I opted to steam my squash BUT roasting it (having it uncovered in the oven at 400 degrees) would have been really good too! If you are using a store bought burger with lil seasonings, I would add more seasonings or flavours to your stuffing mixture. My burgers had a Mediterranean flare to them to that spiced up the relatively mild seasoning of the stuffing. Form into 5 equal sized patties. Make a small indentation in the centre of each patty. When your pan is heated, add your chopped stems, onion and garlic. Saute until caramelized. Add your asparagus with a lil bit of water, stir and pop a lid on your pan. When the asparagus is cooked, add your swiss chard leaves (chopped up) to the pan along with your spices and a lil bit more water. Stir to distribute the spices and pop that lid back on the pan to steam the entire dish and wilt the chard. After a few minutes, the water will have evaporated, the chard leaves will have wilted down and your dish is done. I’m really on a curry kick lately, choose which ever spices you would like with this dish. It’s totally customizable! I really enjoyed this dinner and so did my boyfriend so I hope that YOU can too. Thanks again Kierston for the hook up! Favourite things to do with squash or pumpkin? Categories: Blog Love, Recipe, Recipe Friday | Tags: Candyfit, Carnival Squash, Dinner Ideas, Fall Cooking, Festive Cooking, Healthy Dinner, Kabocha, Meal Ideas, Meal Inspiration, Recipe, Recipe Friday, Recipe Share, Squash, Stuffed Squash | Permalink. 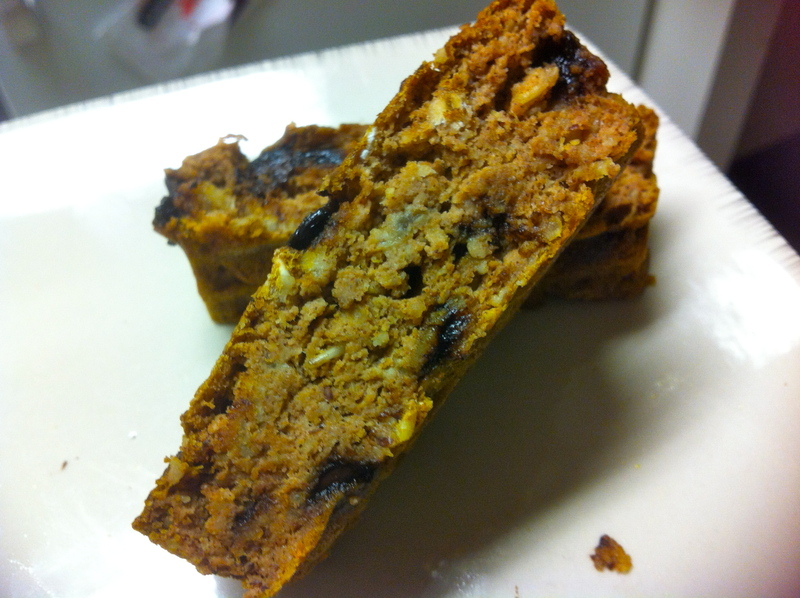 I happened to stumble upon Kierston’s Banana Carob Chip Protein Loaf after paroozing her weekly eats via the WIAW party hosted by Miss Jen over at Peas and Crayons and decided that it had to be made! 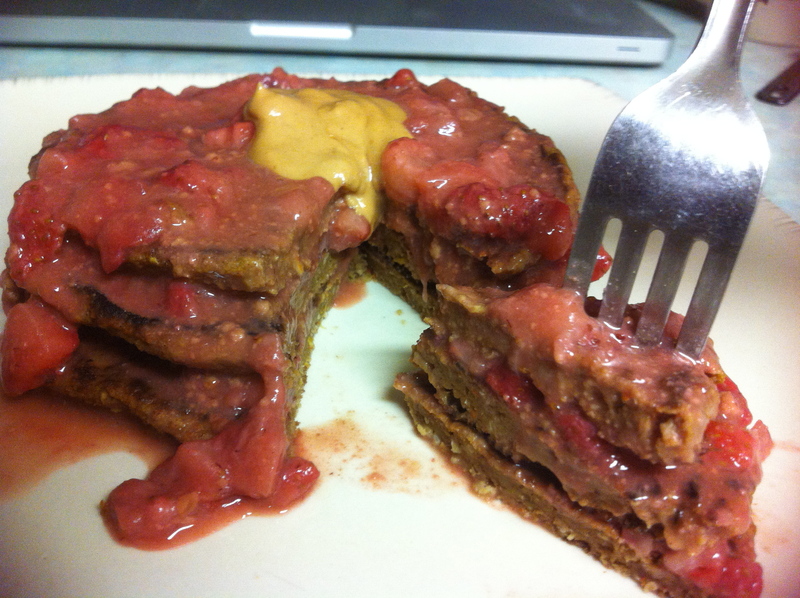 Due to wanting it to fit my own macros a few minor changes to her original recipe and it came out delicious! 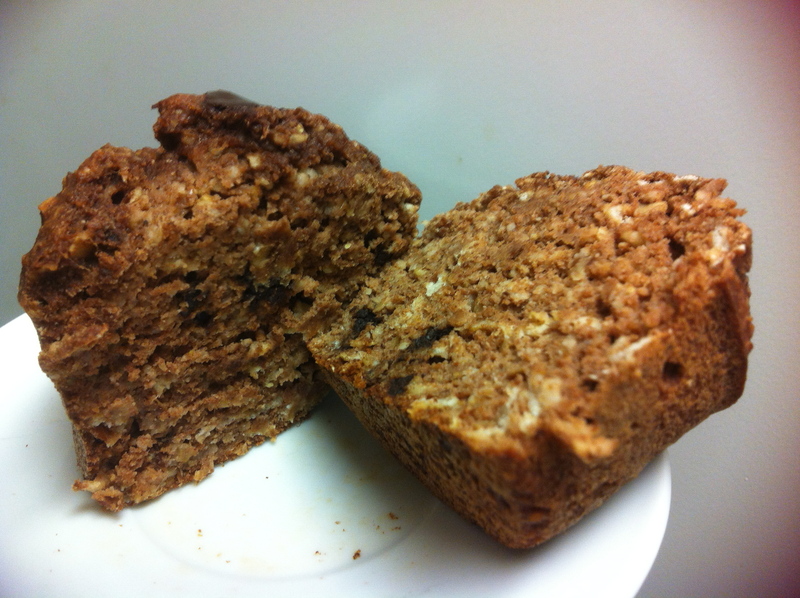 Super moist and subtly sweet from the banana. Yum! Check our the original recipe here. Just note that she also made one with almonds so make sure to check that out too! Toss in the oven and bake until the tops of the muffins are set and golden and a toothpick inserted into the middle comes out pretty much dry (again, you want a tad bit of moisture left because of the use of the coconut flour) ***I tented the muffins with tin foil to ensure that they did not brown quicker than they baked but you can experiment with it. Let cool completely before taking out of the tins and enjoy hot or cold! The reason I cut the muffins in half for a serving is so that I can use it to toss in my proats before my workouts, but the nutritional information for one whole muffin (1/6 of the recipe) is great too! You know what else is great about these muffins? Essential Fatty Acids (EFAs): Important for so many body processes including heart health, lowering inflammation, nourishing skin, nails and hair, and so many more. 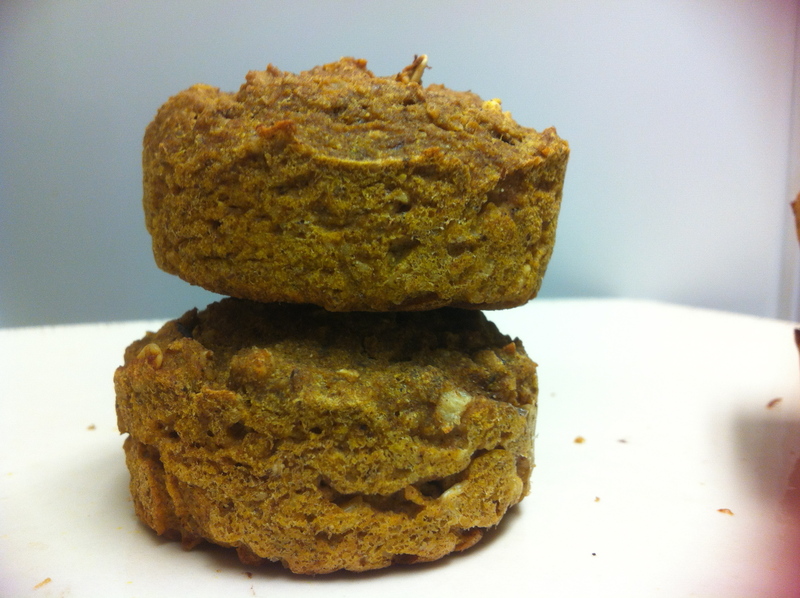 The flax meal in these muffins provide one of the EFA’s, ALA, which can then be converted to the two crucial EFA’s, DHA and EPA. Iron: Found in both the oats and the cacao nibs, iron is important for preventing iron-deficiency anemia which results in fatigue due to the lack of iron in the body to help the red blood carry oxygen in the blood to the cells. Iron is also important for immunity through helping to produce white blood cells to then fight bacteria. So there you have it, delicious and nutritious! That’s what I call a power snack 😀 So where have I been snackin on these babies as of late? 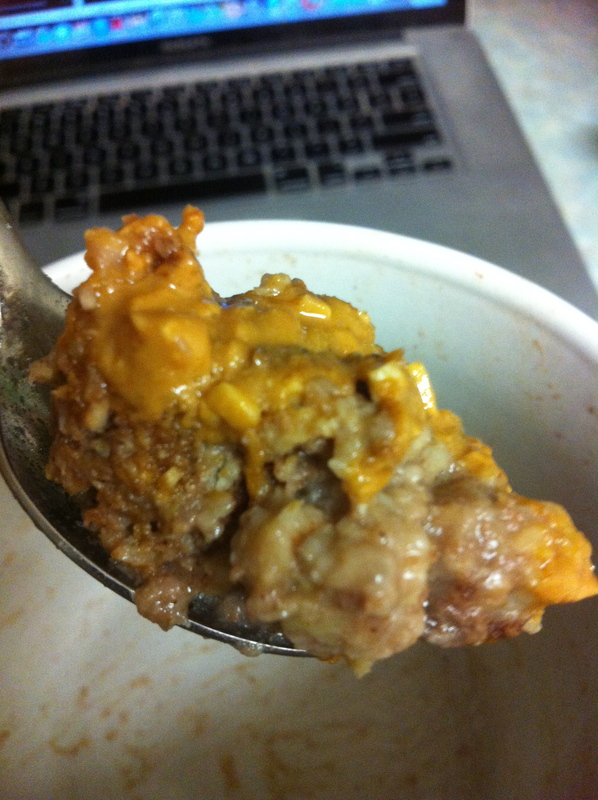 NOMZ….you already know what my pudding mess looks like right? 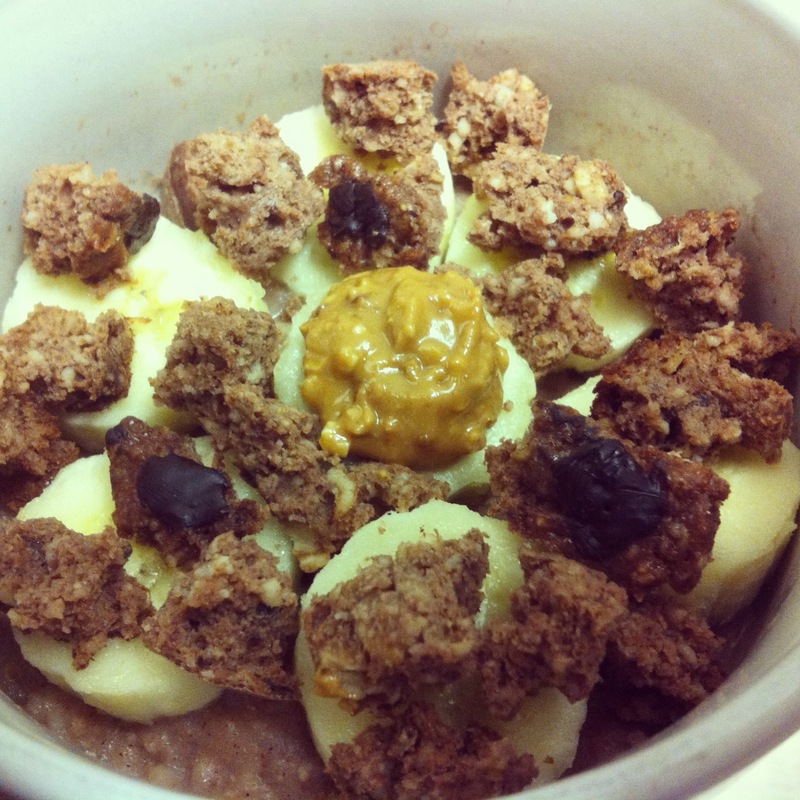 Categories: Blog Love, Recipe | Tags: Baking, Banana, Blog Love, Cacao Nibs, Candyfit, Chocolate, Healthy, Muffin, Protein Muffin, Recipe, Snack, Snack Ideas | Permalink.